"This hat is pretty famous on two counts really and both reasons are linked to it being a ‘ghost’ in the history of The Cult. Any of you who have seen me live over the years will know that I NEVER wear hats so when I donned it for the recording the ‘Lil’ Devil’ video back in 1987 just wearing it in itself was a rarity but then we decided to not use the video and it was very rarely aired. Back in those days when video making cost big bucks and “time was money” a decision was made to shoot both the ‘Love Removal Machine’ and ‘Lil’ Devil’ videos in the UK over two days on a stage set recreating a live show. The ‘LRM’ was shot first and turned out great but when it came to the second day our desperation to make the Lil’ Devil one look as different as possible meant the stage was filed with ‘wigwam’ piles of Marshall cabs and all the band dressed in ‘new’ outfits. Whilst Ian’s Native American look harked back to the early Death Cult days (and looked great) my long leather coat and Stetson was not so good! Needless to say, the whole thing didn’t work, and the band and record company agreed to making the new version in the States. It was that new one that was on rotation on MTV and ended up on our VHS/DVD compilations meaning the ‘hat’ video was consigned to history (thankfully). As for the actual hat itself I picked it up on The Cult ‘Love’ American tour in 1986 as at that time I was kind of into the ‘western’ look. I started buying authentic items such as long “duster” coats too which felt to me like an evolution of the long psychedelic pattern coats I had been wearing onstage around 1985/86. In fact it was on that tour in the US that I got the leather duster coat which I’m also wearing in the first Lil’ Devil video! 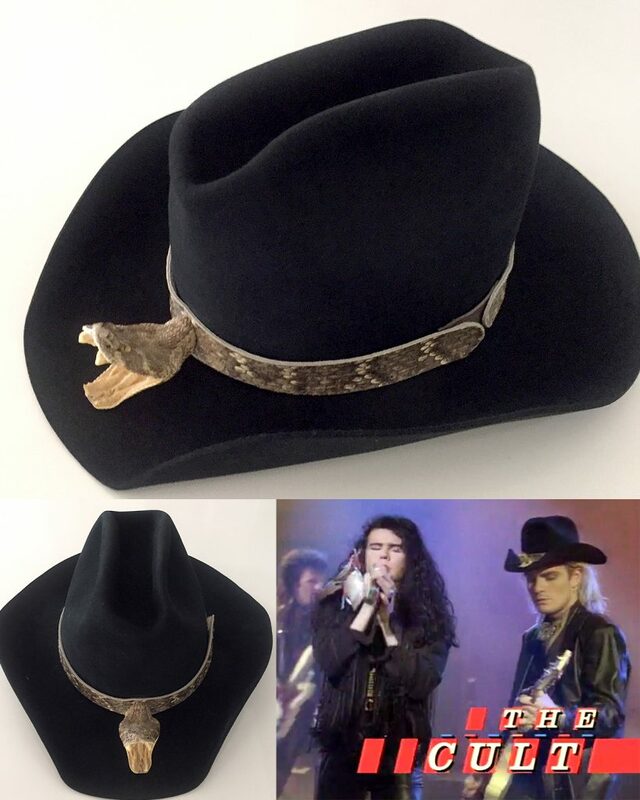 Eventually the ‘Lil’ Devil’ Snake Hat went on display in the Hard Rock Café in Vegas where most people assumed it was Ian’s as he’s the ‘hat guy’ in the band!"